The WAR2110.BA0787 TAG Heuer Carrera Calibre 6 Men’s Watch is part of the latest additions to the Carrera line, and was recently debuted at the Basel Fair in Switzerland. A simple and refined watch not yet released to the public, this will undoubtedly be a popular timepiece when it is released in September of 2010. The TAG Heuer Carrera Calibre 6 is a sophisticated but not overbearing watch that comes in two styles. Buyers can choose between a 5-row polished and fine-brushed stainless steel bracelet or a black leather strap, and cannot go wrong with either choice. The dial is a striking black decorated by an external spiral design. The watch features Arabic numbers that were hand-applied and hands that are polished and luminescent. A small seconds subdial resides at 6 o’clock along with a date window. At 12 o’clock there is a protruding, polished TAG Heuer logo. 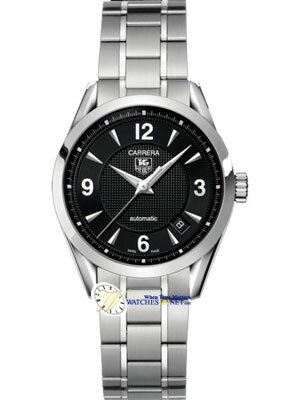 Other features of the Carrera Calibre 6 include a polished stainless steel case and a polished stainless steel fixed bezel. It has a scratch resistant sapphire crystal that has anti-reflective treatment and a sapphire crystal case back. The crown boasts a prominent TAG Heuer logo on its face and is made of polished stainless steel. The watch is water resistant to 50 meters.